Is Cyprus peace a model for Middle East? 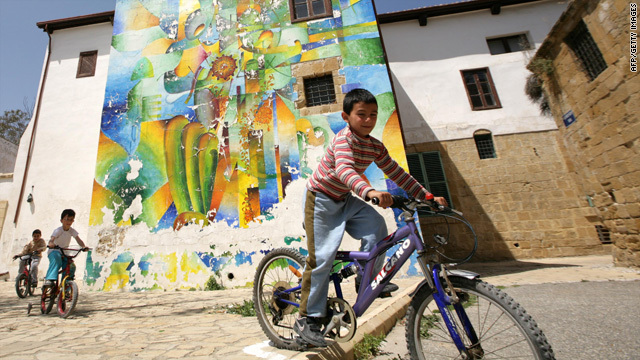 Children ride bicycles in Nicosia, Cyprus, in the Turkish-controlled northern part of the island. Editor's note: David Frum writes a weekly column for CNN.com. A special assistant to President Bush in 2001-02, he is the author of six books, including "Comeback: Conservatism That Can Win Again" and is the editor of FrumForum. Washington (CNN) -- Anybody remember Cyprus? Cyprus does not usually get much attention from the world media. Even in these past days, with the Gaza flotilla dominating the news, eyes have focused on the flotilla's destination -- never its point of departure. Which is too bad. Because Cyprus may offer a good model for how the Israeli-Palestinian dispute might eventually be resolved. Cyprus is home to about 1.1 million Greek-speaking Christians and Turkish-speaking Muslims. The two groups have had a tangled and sometimes bloody history. In 1974, mainland Turkey invaded the island republic and occupied the northern half. Turkey claimed -- with some accuracy -- that the Turkish minority population had suffered abuses at the hands of the Greek majority. But what happened next was also bad: The powerful Turkish army inflicted heavy casualties on Greek Cypriots and drove some 180,000 Greeks from their homes in the North. In 1983, Turkey declared northern Cyprus an independent republic. Turkey has settled 150,000 mainland Turks in the northern parts of the island. No compensation has been paid for the former Greek property. Attempts to negotiate a formal peace between the parties have fizzled again and again. But now here's the unfamiliar part. Despite the fuzzy legal status of the North -- despite lingering angry feelings between Greeks and Turks -- peace has in fact settled upon Cyprus. There has been no major violence on the island since the mid-1970s. The economy on both sides of the line has grown handsomely in recent years. Barriers between the two sides -- including physical barriers -- have begun to open. Greek Cyprus belongs to the European Union and uses the euro; Turkish Cyprus does not. Greek Cyprus has a seat at the UN; Turkish Cyprus does not. Turkish Cyprus even experiences its own version of blockade: While Greek Cypriots can fly to multiple destinations from their international airport, Turkish Cypriots have direct access only to Turkey. But if Turkish Cyprus does not have a legal existence as a country, it nonetheless exercises the functions of sovereignty. Turkish Cyprus keeps the peace on its side of the line: It tolerates no terrorist groups and shoots no rockets. And over time, the two sides have approached closer and closer to mutual acceptance. Younger Cypriots seem increasingly bored by the ancient dispute. Some of the physical barriers dividing the island have been demolished. Will the two sides ever ratify a formal peace? Who knows? And how much does it matter? In Israel-Palestine, by contrast, the international community emphasizes exactly what has failed in Cyprus: some kind of formal and final resolution of the conflict. In Cyprus, growth and development have lulled the conflict even in the absence of a formal treaty. There are hopeful signs that the Palestinian Authority in the West Bank is following the Cyprus example. It's not easy to say exactly what the Palestinian Authority is in law. But in practice, it acts more and more like a government. It deploys a security force. It suppresses terrorism and crime on its side of the separation fence. It oversees impressive economic growth. It negotiates specific solutions to practical problems. The contrast with Hamas in Gaza is sharp -- and in the coming months will likely be sharpened further. The number of manned Israeli checkpoints in the West Bank has been reduced from 42 to 12, as Tom Friedman noted in The New York Times on Sunday. Look for that number to drop sharply again. The leaders of the West Bank Palestinian Authority do seem to have made a strategic decision for peace. Two weeks ago, PA President Mahmoud Abbas told Egyptian TV that the Second Intifada launched in 2000 was one of the Palestinian people's "worst mistakes." When will the hardest problems be resolved? As with Cyprus -- who knows? But the easier problems can be solved first. Maybe these Middle Eastern conflicts end -- not with some solemn proclamation -- but by the gradual accumulation of habits. If the Cyprus flotilla had carried that advice in its boats, it might have brought some valid hope and done some genuine good. The opinions expressed in this commentary are solely those of David Frum.